Managers and OH departments are being urged not to overlook the intense psychological pressures NHS staff are likely to be under this autumn if, as expected, swine flu cases soar. The Department of Health has issued new guidance on the psychosocial care of NHS staff during a flu pandemic. It sets out how to manage the psychosocial resilience of NHS staff working over a sustained period on the flu pandemic, ensure appropriate staff are available to work, and how to support staff recovering back to normal service. It has also identified the factors that could influence the physical, psychosocial and mental health of staff, with the aim of enabling organisations to pre-empt the impact through forward planning. 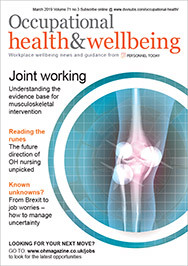 The guidance has suggested that OH professionals would be key in working with HR departments on providing ‘real-time’ supervision and support for staff.